Home Eco Friendly Guide	Whale Tooth With Super-Sensing Power! A magical antidote to poison, once sought by Regality, was till date only an object of fascination and mystery. The majestic spiral tusk grown by the small Arctic whale was known as the narwhal. 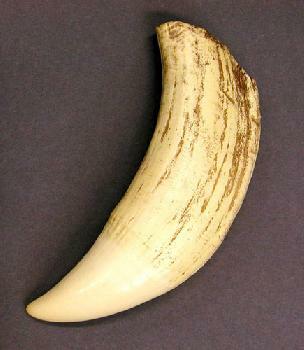 But, science has shed light on the tusk’s unique structure and provides significant clues to its function. Extending up to 9 feet (2.7 meters) and textured like a seashell, the extraordinary tooth, no long just evoke the horn of the mythical unicorn. Two key discoveries on it are made by Martin Nweeia, a Connecticut-based dentist. The findings may further explain whale species behavior and recast thinking on other mammalian teeth. Nweeia and his colleagues used cutting-edge technology to learn that the narwhal’s oversize tooth possesses a rare combination of extraordinary strength and extreme flexibility. It turns out that an 8-foot (2.4-meter) tusk, seemingly rigid, can bend 1 foot (30 centimeters) in any direction. The evidence seems compelling that the tusk may be a hydrodynamic sensory organ that contains an extensive nerve system and gathers valuable information for survival in Arctic waters. The tusk’s nerve system could detect temperature, pressure, motion, and chemical-solution gradients, such as differences in salinity and water particles that would indicate the presence of certain fish prey, researchers say. ← Q#6: What Slowed Ozone Hole Recovery?